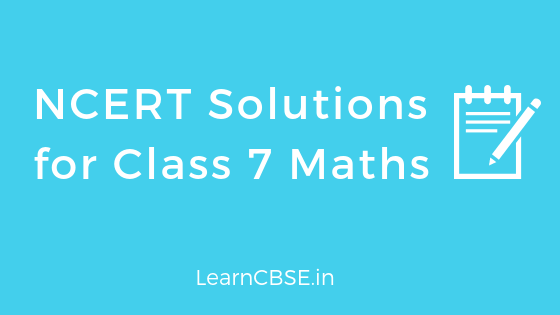 If you are browsing for NCERT Solutions for Class 7 maths, you have reached the correct place. Experienced LearnCBSE.in Teachers has created detailed solutions for Class 7 Maths NCERT solutions. Maths Class 7 NCERT Solutions includes all the questions provided as per new revised syllabus in NCERT Class 7 Maths textbook. NCERT book solutions for class 7 maths PDF can be downloaded in One click without LOGIN. Browse all Class 7 Maths NCERT Solutions from your tablet, desktop or mobile and score more marks in your final exams. You can also go through the RD Sharma Class 7 Solutions and RS Aggarwal Class 7 Solutions which will help you in extra practice and exams. You can also download the free NCERT Solutions for Class 7 All Chapters PDF or save the solution images and take the print out to keep it handy for your exam preparation. Class 7 Maths NCERT Solutions were prepared by subject experts. Step by step solutions to understand problems better. Detailed Explanation to solve problems and formulas are mentioned in between steps to learn effectively. Exercise wise Class 7 Maths solutions also given to access easily. You can download NCERT Solutions for Class 7 Maths PDF or save the solution images and take the print out to keep it handy for your exam preparation.